When ultra-rapid processing, computing and communications are needed in rugged industries, Winmate has you covered. Introducing the Winmate Haswell Series of rugged panel PCs. The Rugged Full IP66 Stainless Steel Panel PC and True Flat P-Cap Panel PC are equipped with Intel’s Haswell Core i5-4200U turbo max processor, offering blazing fast speeds. When combined with the optional Windows Embedded standard 7.0 or 8.1 Industry Pro, the result is an exceptionally quick, robust PC in a tablet form factor. The True Flat P-Cap Panel PC also delivers superior readability with its true flat screen with P-Cap technology. 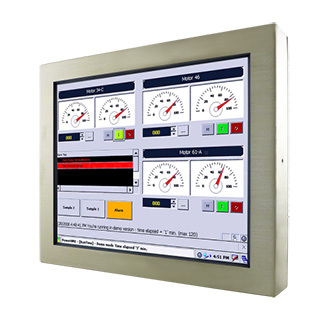 Multi-touch capabilities and hardware options provide greater control and flexibility, making this rugged panel PC a reliable solution in a variety of scenarios. For more extreme environments, the Rugged Full IP66 Stainless Steel Panel PC is built to withstand the toughest industrial conditions while maintaining high performance. ● Screen size available in 15", 17", 19", 21.5"
● Screen size available in 10.4", 15", 15.6", 19", 21.5"
This panel PC offers a variety of options that enable you to customize it to your needs, and like all Winmate products, it was designed to withstand the toughest environmental conditions while maintaining its high performance and elegant look. With complete protection against any type of water ingress, special waterproof ports with screw-on adapter cables are integrated to maintain external connectivity during high-pressure cleaning. Stainless steel housing also protects it against corrosion. Screen options include optional 5-wire resistive touch. Standard I/Os include 2 x USB 2.0, 1 x RS232 serial port and 1 x RJ45-10/100/1000 LAN ports. 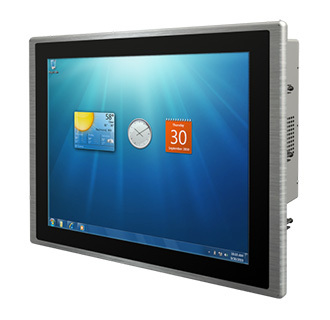 Winmate's flat panel mount PCs and displays are design to bring computing to scenarios where desktop or notebook computers are not feasible, such as distribution and control centers, terminals or other demanding harsh environments. With P-Cap touch technology, users have quick, easy access to the information they need. Multi-touch capabilities have also been integrated to provide greater control and flexibility, making this rugged panel PC a reliable solution in scenarios where Human Machine Interface is used. Winmate Flat Panel PC is also an eye catching and exceedingly elegant design with a sleek glass face and gleaming aluminum bezel/housing. Bottom line, Winmate's series of advanced panel PCs are built to withstand the rigors of harsh environments while improving efficiencies and performance. Winmate has launched a wide range of industrial panel pcs with different housing options to accommodate all types of deployment; this includes true flat p-cap panel mount and stainless steel chassis design.